Here you will get some ramadan sms bangla . 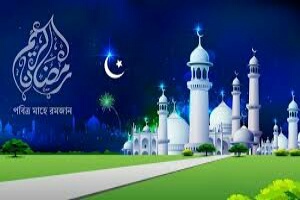 Bangla ramadan sms is for all of you, who love to celebrate ramadan with your friends and family. We should spread the speech of holy ramadan with the best ramadan sms message or text with great images. But if you talk in bangla, than you have to get the sms in bangla language. For your convenience, we have collected some best ramadan sms in bangla. So you can share and send these sms to your known people. Ok, dear friends, no more talk today. Lets see whats are waiting for you. Bangla Eid Sms . kobul koro Allah tumi amar munajat. Dekho oi porbo gogone utheche chand, shuru holo Ramjan mash. Ramjaner agomone rohomoter duar khuleche. Sobai milee sopot kori roja rakhbo 30 ti. Esechi aj tmr ghore bochor ekti ghure, amay jodi tumi rakho 30 din bukee dhore. Namaj Quran Tumi jodi poro tar sathe nischoi tmy chara ami R jabo na oi Jannater ghore. ek, dui, tin ….. eseche rojar din. char, pach, choy ……. roja rakhte kiser voy. sat, aat, noy …… kharaf kaj ar noy. dosh, egaro, baro …… 5 wakto namaj poro. Romzan mase ekti Foroj K Allah 70 ti Forojer soman neki dan koren, ar ekti nofol K ekti forojer soman neki dan koren ( Al-Hadis), pobitor romjan maser suveccha.